This camp shirt or bowling shirt is made from 66% rayon and 34% ployester bedford cord, so the shirt is really soft and has a slight ridged pattern to the weave in the fabric. It is wrinkle resistant with a sand wash finish. 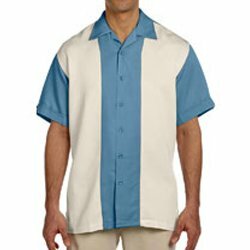 This bowling shirt is a full button up front with buttons that are died to match.